"If the railways are trying to give the people an 'object lesson,'" remarked the prominent citizen, "why I guess Yakima can establish a little kindergarten for the railways." And next day North Yakima, Washington, sallied forth, held up and confiscated a long trainload of Northern Pacific coaland paid for about one-third of it. The railway's monetary loss is regarded lightly by some of the citizens. "It's a small fine for the company's neglect and general cussedness," but the city's honorable business men regret the moral effect of this feature of the historic raid, and its results to the reputation of the town. It is not the purpose of this article to throw more bricks at the railways, though it may shy a peanut shell or two at both sides. But the story of the picturesque episode and its causes is interesting and rather instructive. North Yakima is one of the finest types of Northwestern towns. It was built by irrigation. Seventeen years ago most of its site and the wide sweep of surrounding valley was sagebrush and bunchgrass. Then came the Sunnyside ditch (a Northern Pacific enterprise), which spread a portion of the waters of the Yakima over many thousands of acres of "volcanic ash" soilrichest and deepest in the country. Settlers were invited to come in and take up tracts of ten acres, and upwards, on long time and easy payments. They came, and soon the desert vanished. In its place bloomed apple, peach and prune orchards, wonderful fields of alfalfa and record-breaking crops of the finest potatoes in the world. The town, at first a "wide open" frontier hamlet, rapidly developed into the present-day beautiful city of 10,000 inhabitants, splendid schools, high license, Carnegie library, numerous prosperous banks, good hotels, substantial mercantile houses and fine church structures. Its wide streets, excellent light and water systems, well-edited daily newspapers and other advantages, are also the pride of its people and of the agricultural population of some 15,000 tributary to it. There is no suggestion of the untamed, wide-sombreroed, jingling-spurred West about this peaceful community that almost wrecked a train and freebooted a thousand tons of coal. Some time ago the Federal Government took over the original ditch that began the development of the Yakima Valley, extending and including it with a larger irrigation system. This, together with certain private projects now under way, or in contemplation, means further great increase and prosperity to Yakima with the extension of its tributary agricultural and horticultural region. Naturally the Northern Pacific looks with a jealous eye upon the threatened encroachment of the mysterious North Coast Railway into this hitherto exclusively Northern Pacific territory. It has fought, and is fighting with every device and weapon in the brains and hands of its able counsel, the right-of-way progress of the North Coast. But the ungrateful inhabitants view with anything but alarm the approach of a competing line. "We shall have plenty of cars, then," they say, "to bring us coal and carry our products to market." At the time this article is being written many scores of thousands of tons of alfalfa are heaped in stacks, and sixty per cent of the great potato crop is stored in pits, shrinking daily in weight, while prices are highest, because the farmers cannot get cars. Hence the popular party cry at the last election was "Hooray for the North Coast Road!" It boosted O. A. Fechter, banker, into office as Mayor for the eighth time. Now many Yakima people believe the Northern Pacific feels vindictive on this score, and tried to get even on the town by cutting down its fuel supply. The officials scoff at this as an absurdity, and point to the very general shortage of coal elsewhere. But Yakima always has had to depend almost entirely upon the Northern Pacific for its fuel. The Roslyn mines, some sixty-seven miles away, are owned by the Northwestern Improvement Company, a Northern Pacific allied corporation, that in the past has always supplied an abundance of good coal at reasonable prices to the Yakima Valley towns, as well as elsewhere through the Pacific Northwest. Last Summer the company announced that it had decided to get out of the commercial coal business; that the entire output of its mines would be required for its own use in the train service. "We notified all our leading customers six months ago," explained an official to me at the head offices of the Northern Pacific at Tacoma, "that we should discontinue the trade. They have had ample notice and could have avoided a shortage had they taken time by the forelock and purchased a supply from other sources. You know the old school-book fable of the two squirrels? The gray squirrel said, 'I will labor and gather and store nuts while the sun shines and the days are warm,' but the red squirrel said, 'This is the time to playI can labor by and by'; but by and by the winds blew and the snow drifted, and the red squirrel shivered and hungered and perished. Now these people could have got coal from the Crows Nest mines north of Spokane, or from Wyoming, though that's pretty far," he admitted, "or from the Pacific Coast Company, The mines at Renton, Franklin, New Castle, Carbon Hill, Cumberland. Burnett or the Occidental. Yes, sir, the dealers of the Northwest should have laid in a supply in the Summer." "But," retort the dealers and consumers, "why should we unexpectedly be required to order coal months in advance of our needs? It's the railways' business to furnish cars as we want them. They have done so in the pasthow were we to know they would be short this Winter?" Some railway officials have volunteered statements to the effect that so much agitation against the railways has had a damaging effect upon the business, and hinted that had the Government and various state legislatures let them alone, there would have been less trouble. Many people have pounced upon this as an indication that something like a vast conspiracy exists for the purpose of giving the country an "object lesson" of its dependence upon the good will of the railways. If this be true in the matter of fuel, the roads have been hoist by their own petard in many cases, for their reports reveal serious losses because of shortages of company coal on almost every division. 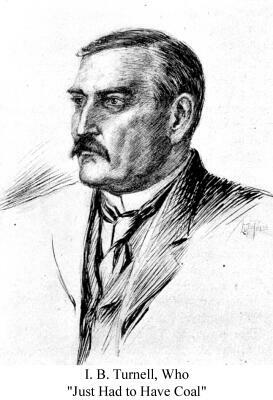 On all sides one hears statements to the effect that in the effort to control the coal supply and gather the profits of the trade unto themselves, the railways have frozen out private coal enterprises, refused to build spurs to private mines, or to provide sidings and cars and otherwise encourage the development of independent mines; that had the companies stuck exclusively to their proper business of providing transportation, and had consequently reached out to encourage new sources of freight, coal would be cheaper and doubly abundant, for there are vast bodies of untouched coal in many parts of the Northwest. But the roads retort that they have had to get control of mines to provide for their own needs. A premature compliance with the new Federal regulation divorcing the railways from the interstate coal trade may have had something to do with the trouble. Then, too, bad management is charged. Instead of equipping themselves to carry more freight, the railways have been applying profits to paying dividends on heavily watered stock or have been using their means to buy each other up. "The money it cost to get Fish out of the Illinois Central would have hauled a lot of Nebraska wheat to market." The Interstate Commerce Commission has reported that loaded cars stand "from two to twenty days at the points, of origin"; cases of "empty cars lost in congested terminals, or lying unused, sometimes in solid trains, for equal lengths of time; of engines broken down from overwork; of trains torn in two by heavy loads; of train crews working extremely long hours without rest, although making only ordinary mileage; of cases being common in which loaded trains took twenty days or more to be moved 250 miles." Whatever be the causes, the Northwest has encountered an appalling fuel shortage accompanied by a season of almost unprecedented cold weather. Yakima was not the first town to confiscate coal from cars destined elsewhere. Driven to desperate straits two or three other small points had already startled the railway companies by seizing coal, in one case an entire car, but it was done in an organized and orderly fashion, the coal being properly weighed and duly paid for. At Yakima the pinch began to be felt as far back as the heavy floods, which absolutely stopped all train service during the latter half of November. 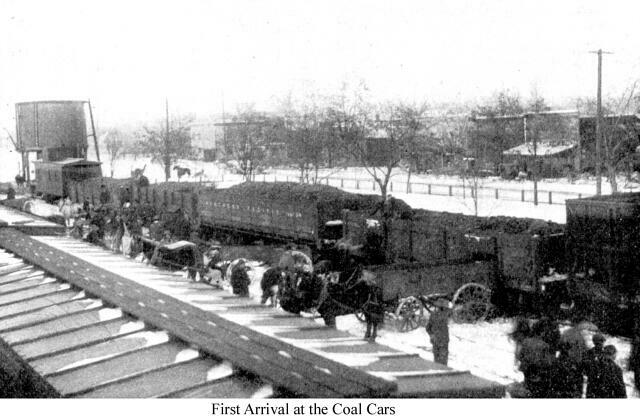 Thereafter coal arrived intermittently in small lots, a car or two at a time. Through all the years in which the company has been selling coal to this large town it has constructed no bunkers or storage bins here; the consumers are obliged to back their wagons up to the siding and shovel directly from the cars. This is a measure of economy, for coal loses weight from the time it is out of the mine; and the plan has been followed to keep only enough coal on hand in cars to supply immediate needs. Consequently any loss of service or shortage of cars is promptly felt. Through December, Yakima people and the farmers far and near had to form in line with wagons day after day, moving up, one by one, to the car, only to receive at times a maximum allotment of 500 pounds. This line-up began as early as 3 o'clock A. M., and often stretched out many blocks in length. As teamsters charged from fifty cents to one dollar an hour for this waiting time, the cost of coal was frequently doubled to the shivering householder. Complaints and questions assailed the company, and the reply was usually "car shortage." 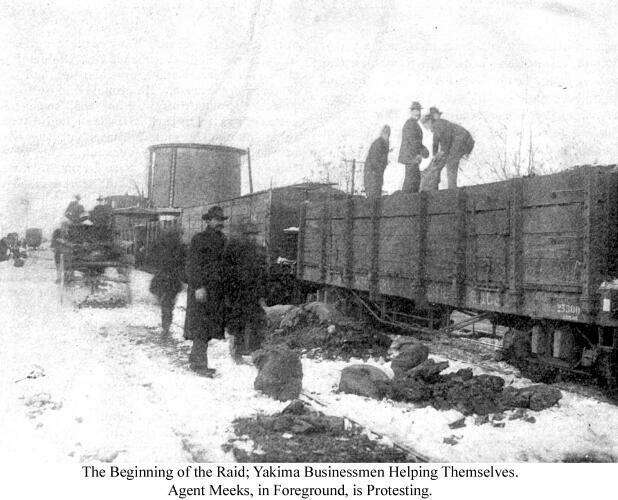 But reports came to Yakima of empty coal cars idling at sidings in many places near; and once, eighteen "empties" stood on a Yakima sidetrack for several daysquite long enough, said the citizens, to have run up to the mines, loaded and returned. So, as conditions grew worse, the people became more skeptical and indignant. The weather waxed colder and they took to their kitchens to economize with cookstove heat only. Boxes, old boards and backyard fencesevery scrap that could serve for fuelwent to drive away the shivers. One day several cars of engine coal arrived. This is not of quite so good quality as the usual commercial grade, and the company says that its Yakima customers turned up their noses at it. Yakima denies this and suggests that the company may have had a call for it elsewhere, and therefore took it away before the town had a fair chance at it. At any rate, the coal of the raided trains was of the inferior grade, and the town seems to have made no complaint about that. Prompted by desperate conditions, an organization of more than a hundred people was formed here today for the purpose of seizing and appropriating the first shipment of coal, large or small, the company attempts to haul through North Yakima. Suffering actually exists. Not a pound of coal is for sale. At least ten cars are needed to relieve the present conditions, and as much more daily while the cold weather continues. May we expect relief? That same day the Yakima Herald had published a very vigorous article setting forth conditions and mentioning the probability of summary means being taken by the citizens to secure fuel. Vice President Levy's reply to the mayor's telegram stated that a dozen cars were in transit to Yakima, but the dispatch was not received until late next day. 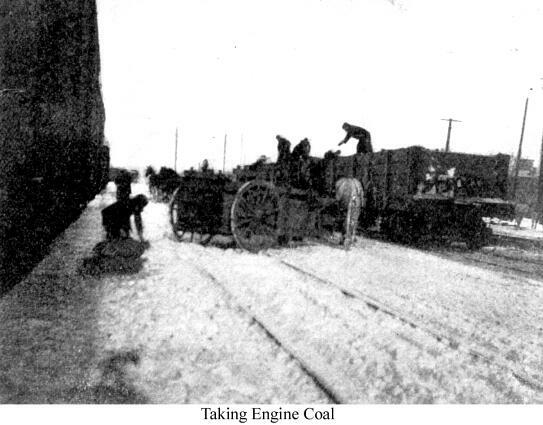 Meanwhile the town had carried out its threat, seizing twenty-one cars of coal January 7. Newspaper reports indicated that the affair was sudden, spontaneous, leaderless. Now, even though driven by dire stress, a modern American town of churches, banks, culture and commerce, does not suddenly rise up and take that which belongs to another, without the counsel, example or leadership of at least one man. "Don't you put my name in your article," said he; "I wont have it. I'll sue you for damages if you mention me." Clearly this was no leader, at least not the leader I was seeking. Also, clearly, the Mayor expected and dreaded criticism. Why? Others informed me. He had failed to meet a crisis for which he had ample time to prepare. Not that he was expected to stop the raid, but he made no attempt to regulate it; to provide that the seized coal should be properly apportioned to all alike, so that the poorest should have equal chance with those owning or able to pay for teams and help; also to see that all should pay the proper price for what they took. Because of this neglect more than halfperhaps twothirds of the coal was stolen. Yakima's business men do not justify thisthey regret it. They feel that the confiscation, while lawless, was excusable; but they know that the stealing side of it cannot but have an unfortunate moral effect. They are not proud of the example to the young of the town. When appealed to at the beginning, to try to regulate the raid, the Mayor had said, "I can have nothing to do with it." Perhaps he felt with the Sheriff and Chief of Police, that by keeping out of it he could, in a measure, escape responsibility. So one had to look elsewhere for the man in the affair. I talked with the railway company's employees at the yards, and they mentioned I. B. Turnell. "He set the examplehe's a bad onehe raided coal cars on his own account here two or three times before this last raid; he's the man that started the crowd to dumping those coal cars." So I made inquiry about Mr. Turnell among Yakima people. "He's all right," they said. "An old railway man; now he's proprietor of one of our hotels. You can depend upon anything he tells you." Almost everybody is ready to abuse the railways privately, but when it comes to utterance for possible publication, many business men are curiously shy. "I don't want you to say I said that," one hears; "you see I have had favors and may want another sometimeI can't afford to have the company down on me." I. B. Turnell was a refreshing exception. A big, tall, two-fisted American, very square of jaw, very wide between the eyes, and very wide across the shoulders, he looks you in the face with a jolly smile, and gives you his views evidently without reservation because of man, God or the devil. The son of pioneers of Wisconsinthat state of La Follette and railway legislationhe became a brakeman in his youth. Having been slightly crippled in an accident, he studied telegraphy, and thereafter continued in the transportation service as station agent and telegraph operator. At one time he managed a railway coal mine in Illinois. Always an enthusiast in railway matters, he is probably one of those railway men who have, through luck, lack of opportunity, or perhaps too ready outspokenness, just missed promotion. Eventually he came to Yakima as night operator at the Northern Pacific station. His wife opened a modest boarding-house which prospered so well that the pair at last resolved to stake their savings and their future in an hotel enterprise. They were succeeding beyond their expectations when the coal shortage began to threaten them with ruin. Having invested their all, they did not secure a large stock of coal in advance of the famine, not dreaming of being unable to get what they wanted as needed. Using from one to one-and-a-half tons a day, when coal arrived in single carloads and consumers had to wait all day in line, only to get sometimes not more than 500pound portions, the Turnells became anxious. To be without coal meant to be without guests, and without the latter, no means to pay rent or help. "I want a couple of your best teams to haul coal from a car I have out here." "That your coal?" asked the drivers. "Looks like itdoesn't it'?" returned the facetious hotel man. "How can we get some?" "By doing as I am doing." Thereupon, as Turnell's team drove away, the others started to help themselves; but by this time Agent Meeks had been warned and he stopped them with resolute language. However, that afternoon four cars of commercial coal were set off on the siding, and the town rejoiced. "I have always found," said Mr. Turnell, "that when you can't get attention by talking soft, talk hard or do something to make the other fellow mad, and he'll begin to take notice." Securing his weight slips from the scales, Turnell went over to the Northwestern Improvement Company's office and paid the surprised agent for the coal he had taken. That happened December 14th. Thereafter, until the holidays, a fair supply of coal was furnished Yakima; then the company shut down on the shipments. On January 3d the hotel man again found himself in desperate straits. Again he found it impossible to buy coal; again he raided a car of railway coal. He had secured one big dray load, and was rapidly getting another, while other teams gathered anxiously around. Suddenly Agent Meeks appeared. "Shoveling coal," replied Turnell, pausing to wipe his brow. "You're stealing it; stop or I'll have you in jail." "Go ahead and get your warrant; I'll go to jail," returned Turnell, resuming work. "Stop," shouted the resolute Meeks, now addressing the drayman, "or I'll have you prosecuted." In dismay the drayman dropped his shovel. "Now put back what you have on your wagon." "Drive off," ordered Turnell, "I've got enough, anyway." "Don't you dare to do so," cried Meeks. Again the drayman hesitated. Thereupon the lawless and square-jawed Mr. Turnell jumped upon the box and drove the team away to the scales himself. The following Sunday morning, rising very early, he discovered that the company was about to set a car of commercial coal upon the siding. Without waiting for a line to form, or the agent of the coal company to arrive, he helped himself to six dray loads. "What!" cried Mr. Hessey, when Mr. Turnell tendered payment, "you got away with six loads when there's hundreds waiting their turn at it? Do you know what I think of youyou're a hogthat's what you are." "Perhaps you don't care what I think of you," persisted the indignant agent. "Young man," retorted Turnell, "be calmwanted coal." Afterwards he remarked, "If other people were willing to be put off and be doled out to until they were ruined or frozen, I was not. I know there has been no legitimate excuse for the coal shortage and car shortage everywhere. I believe that greed and mismanagement from headquarters back in St. Paul and New York are at the bottom of it. Every subordinate official has had Jim Hill's motto, 'Maximum load with minimum haulage expense,' drilled into them until it has become a crime to run a train of less size than will absorb every ounce of the engine's power. Consequently there has been nothing but trouble and delay, and cars take three or four times the number of days to make hauls that used to be required for the same trips." In which statement Mr. Turnell repeated in effect what the Interstate Commerce Commission has reported. "You know that it wouldn't be right for me to advise breaking the laws." "But you don't expect us to let our families freeze?" "No," replied the Mayor, "and under the circumstances, no jury would convict you for taking the coal if you can get it." Next day the crowd of drays began to assemble about the railway yards before daybreak. Noon came and no reply had yet been received from Vice-President Levy. All day the crowd increased. Farmers and orchardists from many miles out of town foregathered with townspeople, stamping their chilled feet, rubbing aching ears, swapping stories of hardships suffered at their homes, or exchanging comments. "That man Turnell's been getting coal," some one remarked. "We ought to have as much gall as he has." Shortly after 2 o'clock a freight pulled in from the west and shunted a couple of coal-laden cars upon the coal company's siding. "Look at that!" cried the crowd, "there's only a sackful apiece for us." "There's a coal train up the track!" Scores of wagons immediately raced for it, but as the train proved to be a long one, there was room for all. 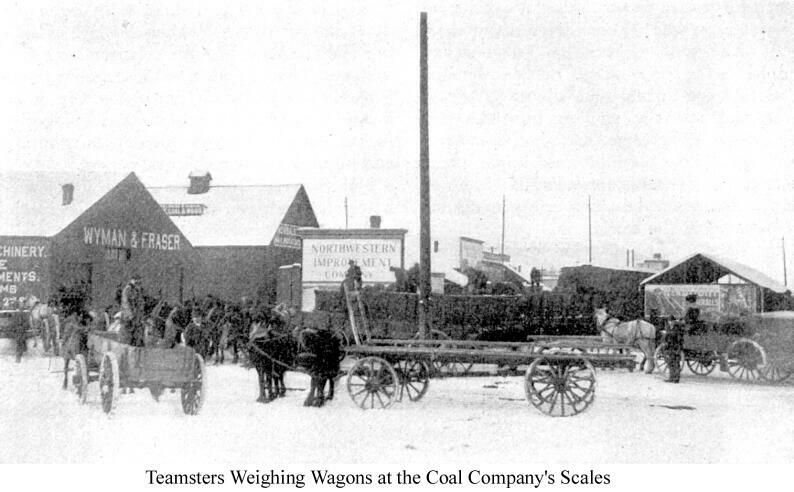 Every dray, express and lumber wagon in town was pressed into service, while men and women ran from one teamster to another to engage the hauling of small portions of the precious loot. Hundreds of men and boys, women and a few small girls sailed into the piles that were thrown off onto the ground and filled boxes, baskets, sacks and even lard pails and handkerchiefs, but all women who came were helped until they had all they could carry. Comparatively a small showing was made in the quantity taken, however, when the engine backed down, coupled on and started the train southward. Wagons were quickly driven across the track, and the crowd gathered begging, pleading, warning and threatening the engineer, and trying to get him to set the coal cars in on another siding. He refused, and steamed slowly down the track, intending to pull out at a rapid gait as soon as the siding was cleared. "Dump the cars!" shouted a man. Some say it was Turnell, but I could not definitely learn who struck off the patent dumping control of the first car. When the train began to move most of the crowd scattered, but a considerable number remained on the cars. These quickly freed the adjustable bottoms of ten of the cars, and the coal poured down upon the track and along the sides. The train stalled directly opposite the station. A quartermile of track was littered deep with coal and the people gathered about it like flies along a streak of honey. The engineer managed to get away then with about half his train, pulling it down the track to another siding. But in a few minutes another raid had started, and much coal was taken before the harrassed engineer again got under way and took his train further on still to Yakima City. The spirit of loot was rampant, and Yakima City swarmed out like a hive of bees. Here at last the railway people took charge of the cars, and sold coal to all who came. 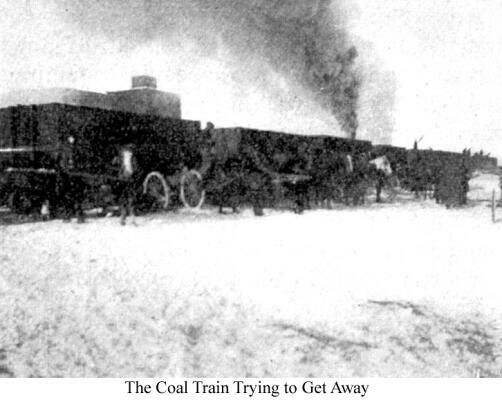 Meanwhile another coal train had pulled to the yards shortly after the first had been stalled at the station. It, too, was raided with a whoop! and eleven more cars were dumped upon the track. The news had spread all over town and the people "come a-running." Business men and laborers, rich and poor, young and old, labored with quiet enthusiasm and thorough good nature. Some people were in a panic lest the hundreds of tons would be gone before they could get a share. One man was seen to remove his overalls, tie a cord about each lower extremity, then filling the improvised sack to the waistband, hurry home joyfully with the load. 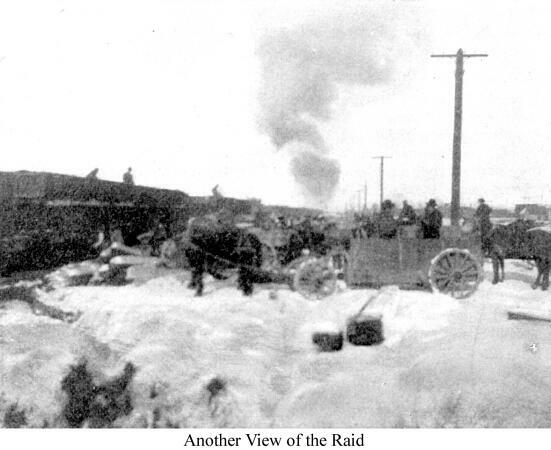 Early in the raid a quick-witted railway employee turned in a fire alarm, and the Yakima department dashed out across the tracks. Scarce one of the busy looters looked up from his work, however, and the ruse was without effect. At last, after dark, the authorities took charge, and thence on all coal was weighed and accounted for. That night saw cheer in every Yakima home and farmhouse round about. Next day many more cars came in, and, ever since, Yakima is said to have enjoyed the distinction of having more coal per capita than any other town away from the mines in the Northwest. "If you can't get attention by talking soft," says Mr. Turnell, "talk hard or do something, and they'll take notice."